"This novel is so fast-moving, so expertly arranged, every piece fitting together with a well-oiled snap, that it feels weaponized. Read it. Or else." Michael Hendricks kills people for money. That aside, he’s not so bad a guy. Once a covert operative for a false-flag unit of the U.S. military, Hendricks was presumed dead when a mission in Afghanistan went sideways. He's since left behind his old life—and beloved fiancée—and set out on a path of redemption... or maybe one of willful self-destruction. Now Hendricks makes his living as a hitman with a catch: he only hits other hitmen. For ten times the price on your head, he’ll make sure whoever’s coming to kill you winds up in the ground instead. It's not a bad way for a guy with his skill-set to make a living—but it's an even better way to make himself a target. Named a Buzz Book 2015 by Publishers Marketplace! Click through to read an excerpt. "With THE KILLING KIND, Chris Holm has created a story of rare, compelling brilliance... You won't merely read this book, you will inhale it." "Holm’s premise is irresistible... As a hitman who only kills other hitmen, Hendricks is a brilliant study in gray morality... the story morphs into a tension-filled game of professional killers hunting each other through a series of crackling, imaginative twists." "Holm’s action scenes are breathtaking whirlwinds, and even when readers know what’s next, he builds an improbable level of suspense... it's clear he's a writer with a strong future." "...an ultra-strategic cat-and-mouse game of mind-blowing proportions... Holm, an award-winning short-story writer and author of the fantasy-pulp fiction trilogy 'The Collector,' is terrific at rendering characters with empathy and humor... As the second half careers along with roller coaster speed and twists, meting out some seriously emotionally wrenching moments and showing that Hendricks is more than a match for MacGyver, you’ll want to go along for the ride—but keep that seat belt fastened." "THE KILLING KIND is well-described and vivid… a fast, hard-edged thriller that doesn’t pull its punches… a white-knuckled ride to an explosive finish." "The reader can’t help but be fully invested in what befalls the players in this thriller. Holm has put fully formed people on the page… and then proceeds to do horrible things to them. Because that is what exceptional authors do." "THE KILLING KIND moves like a tank with a Ferrari engine... [it] had been one of my most anticipated reads of 2015 and I’m happy to say that my expectations were met, and then some." "Chris Holm loads an ingenious premise—an assassin who kills only other assassins—into a high-powered story that goes off like a rocket. His protagonist, Mike Hendricks, is an all-American anti-hero with his own code of justice, living on stolen time. THE KILLING KIND is sleek and smart, and will stay with you long after you've finished reading." “THE KILLING KIND is an intelligent and droll shot of adrenaline that aims high and more than makes the mark." "Holm takes a one note premise and pulls the reader in with beautiful narrative and excellent pacing... If a movie deal hasn't been made, I'm sure there's one in the works." "...a fast-paced thriller with high-octane action, gripping suspense, clever plot twists and a high body count. [Holm] has created an original plot with characters so vividly complex, even the good guys are fatally flawed, willing to bend the rules for their own ends." "Holm is an expert craftsman. THE KILLING KIND is a special blend of knock ’em, sock ’em and intelligence." "Deftly written and with a blistering final act that begs to be read in a single sitting, THE KILLING KIND is the kind of novel ripe to push Holm forward as a new and powerful voice in thrillers." 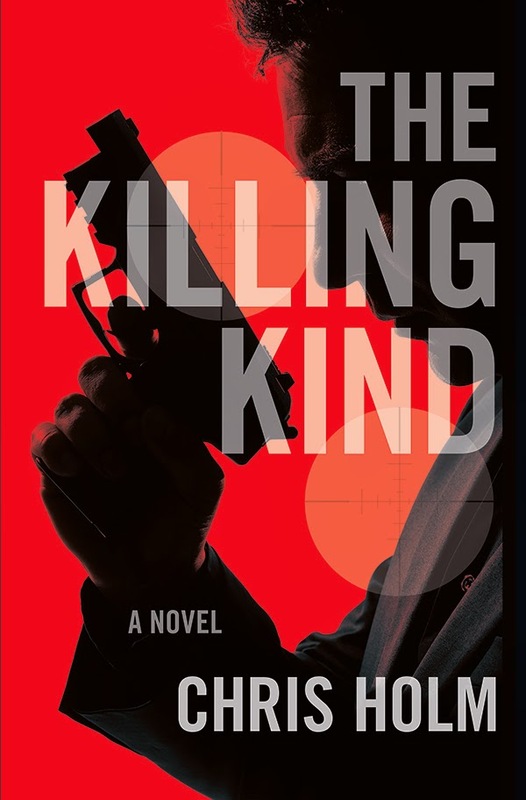 "THE KILLING KIND may remind some readers of the cat-and-mouse thrillers of Thomas Perry... that's high praise, because when Perry is working at the top of his abilities, he has few equals in the genre. THE KILLING KIND is the kind of well-wrought entertainment that builds an enthusiastic fan base." "About as close as you can get to a perfect thriller experience... More than worthy of all the nominations it has garnered, THE KILLING KIND is written with the leanness of a crime writer but the soul of a romantic." "Chris Holm's whip-smart tale of a different kind of professional killer moves as fast as the bullets fired by his hero, Special Forces vet Michael Hendricks, and with wit as dry as the Afghani desert where Hendricks allegedly died." "Chris Holm's THE KILLING KIND is my favorite thriller of the fall lineup. Here's a solid gold premise: an assassin who only kills other assassins... The cat-and-mouse game that follows is pure joy...This novel is so fast-moving, so expertly arranged, every piece fitting together with a well-oiled snap, that it feels weaponized. Read it. Or else." "Holm carries off a preposterous plot with brazen aplomb, creating a diverting, action-packed story interspersed with excellent character vignettes." "An ingenious cat-and-mouse game... Please, somebody, make this into a movie." "When one devilishly efficient hitman is matched against another hitman of equally inhuman skills, what happens? The answer to the question is what the American writer Chris Holm’s freewheeling new thriller is all about. Bloodshed ensues of course, but Holm supplies the reader with a rooting interest in all the death and dying… The showdown between the two guys is long, inventive and specific in its ferocity." "THE KILLING KIND is like reading the best of Thomas Perry, with a style all its own." "Previously known to readers for his outstanding, intricately plotted and laced with dark humor urban fantasy meets noir Collector trilogy, Holm has both shifted gears somewhat and at the same time upped his game with THE KILLING KIND."